Syrian government war planes have launched one of the heaviest bombardments yet on the city of Palmyra, which is held by Islamic State (IS) militants, activists say. About 25 air strikes left at least 26 people dead, including 12 militants, the UK-based Syrian Observatory for Human Rights said. IS captured Palmyra, which includes a Unesco World Heritage site, in May. Elsewhere, air strikes on Idlib killed 17 people, the Observatory said. The city of Idlib is a stronghold of an alliance of jihadist and Islamist groups calling itself the Army of Conquest. Syrian military sources quoted by Reuters have said Syria is using new types of very accurate weapons supplied by its ally, Russia. Earlier on Friday, the US and Russian defence ministers spoke by phone for the first time in more than a year to discuss the crisis. The US has said Russia is building up its military presence in Syria as President Bashar al-Assad loses ground to the various rebel groups confronting him. 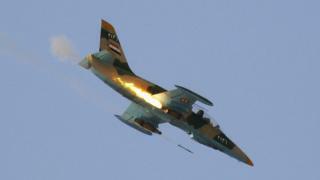 The latest air strikes came a day after Syrian air force jets attacked Raqqa, the de facto capital of IS. "In the past two days, the regime has intensified its air raids against areas controlled by the Islamic State group," Observatory spokesman Rami Abdel Rahman said. Since occupying Palmyra, IS has destroyed some of its most famous antiquities including its two main temples and three funerary towers. Unesco's director-general Irina Bokova has said the systematic destruction of the city constitutes a "war crime". IS has ransacked and demolished several similar ancient sites that pre-date Islam in Iraq. In another development, it was reported that the rebel coalition that captured an air base in Idlib recently had shot dead 56 soldiers it had taken prisoner. The Observatory said the mass killing by the largely Islamist coalition took place a few days after the Abu al-Duhur airbase was seized on 9 September, but had only recently been confirmed by sources on the ground.